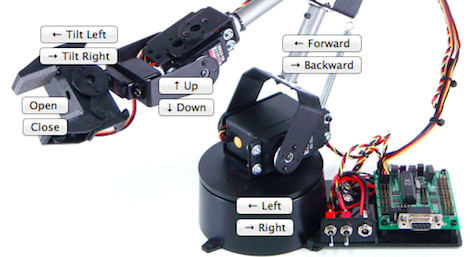 The guys over at Rusty Nail Workshop have put up an Internet controlled robotic arm for your amusement. While you’re waiting for the turkey to be done (or, you know, working), try your hand at moving some LEGO pieces around with a remote-controlled robotic arm. The build log goes through the parts needed for the build. The arm itself is a Lynxmotion AL-5D, a heavy-duty device that’s far more capable and looks a lot better than our old Armatron. The arm is controlled by an Arduino Uno. The Arduino is connected to the arm’s servo controller. Movement commands are received by an Ethernet shield and translated into servo commands. The entire build runs independently of a computer just like this project’s inspiration, the Orbduino. Of course you can imagine the mayhem that would ensue if multiple people tried to take control of the robot simultaneously. A bit of code on the project’s website makes sure only one person has control of the robot at any given time. Check out what somebody else is building out of LEGO blocks with a Waldo. If you’re lucky, you’ll be able to knock that work down.